King Solomon was revered for his wisdom, but the King also valued prudence – acting cautiously and with wisdom. “Get wisdom; get prudence. Forget not, neither decline from the words of my mouth,” he says in Proverbs 4:5. His prudence and wisdom amassed great wealth and earned him a reputation as a fair and just arbiter of problems large and small. 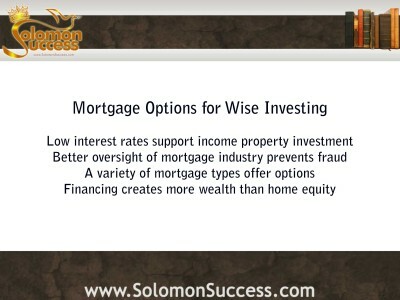 In today’s world of income property investing, prudence and wisdom play a role in selecting options for financing and refinancing investment properties at current low interest rates. Mortgages are available from a variety of lenders in several forms. In many cases, these lenders are actually loan servicers that administer loans originating with major financial institutions such as the government’s Fannie Mae (Federal National Mortgage Agency) and Freddie Mac (Federal home Loan Mortgage Corporation). With varying policies on loan terms, refinancing options and mortgage holder support, owners of residential property have a number of choices for financing and maintaining their purchases. Typically, mortgages available to home owners and investors alike are fixed rate loans with terms of 15 or 30 years. These types of loans lock in a payment rate at the time the loan is originated, which remains constant for the life of the loan – a kind of financing recommended by Jason Hartman for its stability and predictable monthly payments. Adjustable rate mortgages, or ARMs, also available on 15 to 30 year terms, begin with an introductory low rate which adjusts upward over the term of the loan based on the movement of an external index such as Treasury securities or the Cost of Funds Index. Although initially a bargain, this risky type of mortgage was responsible for much of the 2008-2011 housing collapse which saw record numbers of homeowners faced with suddenly ballooning mortgage payments after those initial low rates expired. The interest only mortgage loan is a lesser-known option but one which, financial advisors say, can increase cash flow and encourage continuous tax savings. With this type of mortgage, payments may be lower than with the typical fixed rate loans, creating potential savings that can be stashed in other investments or interest accruing accounts. And since mortgage interest is tax deductible, the tax savings on an interest only mortgage remains relatively constant for the life of the loan, with no amortization of interest as in fixed rate mortgages. Paying off a mortgage or buying a property with cash may seem like the best way to own property without carrying debt. In the world of smart income property inverting, however, the variety of financing and refinancing options available at current low interest rates makes it possible to protect the investment and increase cash flow while keeping savings secure.